Alan AD6E, David N6HD, Arnold N6HC, Walt N6XG, Pista HA5AO, Gene K5GS, Ross K6GFJ, John K6MM, Kevin K6TD, Stu K6TU, Tom ND2T, Steve W1SRD, Les W2LK, Mike WA6O will be active from Chesterfield Islands 1 - 12 October 2015 as TX3X. QSL direct Chesterfield Expedition, P.O. BOX 1100, Kenilworth, Warwickshire, CV8 2YT, England, OQRS, LOTW. W4HK Chief Pilot, Pilot North America. 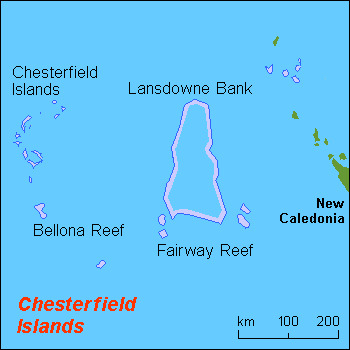 TX3X Chesterfield Islands DX Pedition News 16 December 2016. TX3X Chesterfield Islands News 12 December 2015.
e-mail: to k5gs@pdxg.net with the details of the missing Q. - Several "Not in Log" call signs were reported to be found in the logs of other DX-peditions or a Cuban Special Event station that were active at the same time as TX3X. - Individuals that donated to the project at any time, your LoTW was uploaded. - OQRS PayPal requests are processed daily, please allow 24 - 48 hours for LoTW upload. - If you made a donation or processed an OQRS using PayPal and are missing an LoTW send an e-mail to: k5gs@pdxg.net All others, please wait for the complete log to be uploaded. - Direct cards should be mailed to the address in the United Kingdom as shown at TX3X.com Those who send direct cards - your LoTW will be uploaded when we enter the contact information into the system. QSL requests received with insufficient funds will be sent via the Buro. - We're finalizing the QSL card design and will send to the printer by December 18th. Cards will be mailed from the UK in January. After 3 full days at sea we arrived at the island at 10:15 (local) on 1 Oct, we had good weather throughout the sea voyage. The skipper brought the boat as close to the island as possible, about 500 meters. We began loading the Zodiac and ferrying equipment to the island at about noon. All the equipment is now on the island, we raced against sunset to get as much done before we returned to the boat for the evening. We have several tents installed and two antennas, but not enough for the team to spend the night. The wind was intense which made it difficult to install the tents. We will return to the island at 06:00 on Friday morning and expect to have one CW and one SSB station on the air soon after. The Expedition Yacht Evohe sailed for Noumea, New Caledonia on Thursday afternoon (New Zealand time). Expected sailing duration 6 - 7 days. Aboard the boat is a crew of 5 and one amateur, Pista HA5AO. She's following the New Zealand northeast coast and will soon be on a course to Noumea. The remainder of the radio team will assemble in Noumea between 25 - 26 September, with a planned departure date to Chesterfield on 28 September. We appreciate the support we've received from around the world, and especially the from the New Zealand firms and individuals that assisted with the project and provided invaluable support. At 4:30 AM this morning got a call from Ross (K6GFJ). They're safely back in New Caledonia but because of rough seas had to land in Koumac on the NW shore instead of Noumea on the SE shore of New Caledonia. A few sea-sick folks aboard, but happy to be on land again. They'll take a 5-hour bus ride today from Koumac to Noumea and should still be on schedule for their booked flights home. The online log will be updated very soon. I complimented the team for a job well done, especially under difficult propagation and weather conditions. every night listening 6.30 UTC to 7.30 UTC on 21.285, 18.130 and 14.185 MHz and never call SA ! yours signals 55 to 57 ..What's up ? Hi Team. Tnx very much for ATNO. In current poor HF condx please start on LF earlier on your SS and SR. It seems a wasted opportunity a the moment. Hi Team, please more time on 80 and 160m for Asia! 73! Great adds for sure ! here looking for an ATNO on cw regular band !one qso will be enough !donation will follow a cfmd qso ! I will not pau b4 anymore !I just got my lesson with EP6T ! it was the 1st and the last donation b4 ! Wish you all the good things ,and please remember that eastern NA greyline is about same time as west EU !if you don't call for NA only we have no chances ! best time 20 meters: 1300-1430 Z and 10- 15 meters: 1900-2200 Z ! wish u all the best !